The global synthetic diamond market is highly consolidated in which the top three companies, namely SandvikAB, ElementSix, and ILJINCo. Ltd, hold three fourth of the share in the market. A research study by Transparency Market Research finds that forward integration has aided these companies clinch top positions. Their future, however, shall depend on well-thought-out investments in research and development activities to bring down the cost of manufacturing and improve the quality of the product. As per the report, savvy companies in the global synthetic diamond market should consider setting up shop in emerging economies of Asia Pacific for cost benefits and higher returns on investments. Tying up with research institutes to slash research and development costs will also hold the companies in good stead, finds the report. The TMR report predicts the global synthetic diamond market to expand at a CAGR of 7.0% between 2015 and 2023. Rising at this rate, the market will likely attain a value of US$28.83 bn by 2023 from US$15.73 bn in 2014. The two types of synthetic diamonds available in the market are rough and polished. Among the two, the rough synthetic diamond held a lion’s share in the market – precisely 98.8% – in 2014. Polished diamond, on the other hand, accounted for a paltry share in the market in the same year. Going forward too, the demand for polished diamonds will remain lackluster, while that of rough diamond will continue to soar at a healthy clip on account of their growing usage in electronics, healthcare, and construction sectors. 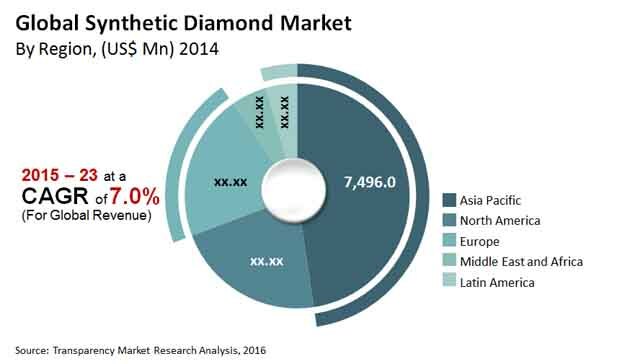 From a geographical standpoint, Asia Pacific is slated to account for a leading share of 55.8% by 2023 in the synthetic diamond market. The growth in the region will be powered mostly by the flourishing construction industry in the emerging economies of the region. Besides, booming industrialization and ever-increasing demand for jewelry are also expected to underpin the growth momentum in the Asia Pacific market. China and India are two of the prominent markets in the region on account of most of the leading players building manufacturing units in the two countries to take advantage of low operational costs. “Synthetic diamonds are indispensable in various industrial applications such construction, computer chip production, oil and gas exploration, mining activities, stone cutting and polishing, and in surgeries. Thus, the definite rise in these activities has led to an uptick in revenues in the synthetic diamond market,” points out the lead analyst of the TMR report. The ability of synthetic diamonds to stay unscathed in extreme conditions, high thermal conductivity, low toxicity, and strong chemical inertness has made them sought after in the aforementioned industries. Hence they find application in high-energy research facilities and for abrasive tasks such as cutting and polishing. Furthermore, the relatively cheaper cost of synthetic diamonds, helps them steal a march over natural diamonds. Also, they are available in various colors which makes them perfect for jewelry. One factor proving counterproductive to the global synthetic diamonds market is the complex procedure of manufacturing large-sized synthetic diamonds. Creating a sizeable product with the right cut, color, and clarity is an involved and time-consuming procedure.